This is not so much a procedure as an overture to some other repair, in much the way as making the initial incision hardly counts as a surgery. However, getting it wrong in either case can lead to disaster for the patient, so it is not to be minimized. In the vast majority of cases, the section is merely snug in the barrel, and a very little effort gets it out; less effort than breaking into a soft drink bottle. However, it does happen that sometimes the section is unwilling to come free easily. Some foolish previous repairer may have used some kind of adhesive, or used too little patience in fixing a loose section. The barrel may have shrunk over the years, gripping the section with extra force; a lot of Watermans of the 1940s have textured sections which makes this a nightmare scenario. A burst sac may have filled the barrel with ink, which now acts as a cement. I mention these things before going into the technique itself because thinking about why a section isn’t letting go is extremely important in avoiding doing any damage to the barrel. Ponder frequently. Apart from the inadvertently stuck section, one should also be aware that some sections are threaded. Prior to 1950, this was usually only the case in button-filling pens, although once Sheaffer began using vacuum fillers one could find threaded sections in just about any of their models. Very infrequently, the threading will non-standard (UK-made pens seem to be most inclined to this), and “righty loosey” is a very tricky thing to convince your body of; another reason for pondering. Now that I’ve rendered the reader incapable of simple motor functions by insisting on those functions being consciously considered, what is the way of getting a section out? There is a progression of steps, and prior to any of them the pen should be warmed to reduce brittleness as far as possible. First, merely grasp the pen by the barrel in one hand and section in the other, and give a little tug. A good way of practicing for this is drawing the cork from a champagne or Belgian beer bottle (although keeping the practice and the application separated by sufficient sobering-up time is wise), as there is a similarity between the way both will release. The important thing is to keep the forces in line with the barrel of the pen; there may be a little wiggling to get the section free, but always remember than any sideways force might crack the barrel. The more brittle a pen, the less latitude there is, and I suggest having a look at the Materials page to get a sense of relative crackibility; as a rule of thumb, the older the pen, the less room for error. If the section doesn’t come out with relatively little fuss, try rotating the section in place. Grip the barrel as close to the joint as possible, and be careful that the effort is all rotational; it is far too easy to bend when you mean to turn. If uncertain whether the section is threaded, try rotating in both directions. Even if the section isn’t threaded, the torsion may release the friction that keeps the section from coming out. If the section can spin, it can in theory emerge. Beyond this, the matter is essentially one of escalation; more heat (keeping in mind my personal guideline “too hot for my fingers is too hot for the pen”) with longer exposure to release any misapplied shellac or sealant, better grip in the form of the no-slip shelf liner rubber that can be found in grocery stores. 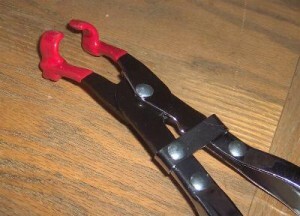 The ultimate escalation of grip is the application of section pliers, but this should be seen as a last resort. While one does still have a sense of how much pressure one applies when using pliers, it’s a muted sense, and more fragile sorts of section may perish under what seems not a lot of pressure. This is especially the case when it’s being contrary about emerging from the section, because one’s focus tends to be in the “Move, wretch!” direction rather than “Easy now….” It is frequently wise to set the matter aside if several minutes of effort don’t produce results, applying the next escalation only after resetting one’s frustration gauges.